The project “Open Art in Harmony” has begun in the Natuzzi Italia store in Hangzhou, the capital of Zhejiang Province in East China. 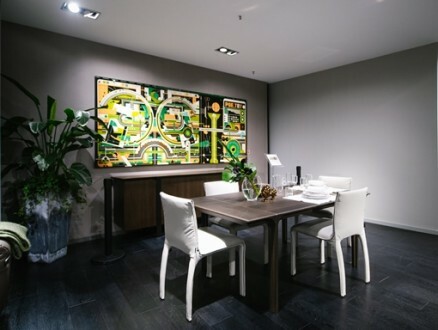 The event, which was held on June 28th, is the first of eleven dates that, from June to October, will bring art inside the Natuzzi Italia stores throughout China. Natuzzi and art have been talking to each other for a long time and now, after numerous projects all around the world, the dialogue continues in China for the first time. The launch of the project, held in Shanghai on May 8th, saw the participation of Pasquale Natuzzi, CEO and Founder of the Natuzzi Group, and Pasquale Junior Natuzzi, Chief Marketing & Communication Officer, a proof of the importance of art for the Natuzzi brand. The artist who took the stage in Hangzhou was Nisky Yu from Shanghai who explained to the audience its lively vision of art and how its work connects with the concept of harmony by Natuzzi Italia. Nisky’s artworks were showed in the Hangzhou store until July 12th and then went back to the famous Galerie Dumontiel in Shanghai. Next stage of this artistic project by Natuzzi Italia is Suzhou on July 25th, followed by the event in HeiFei on August 16th.